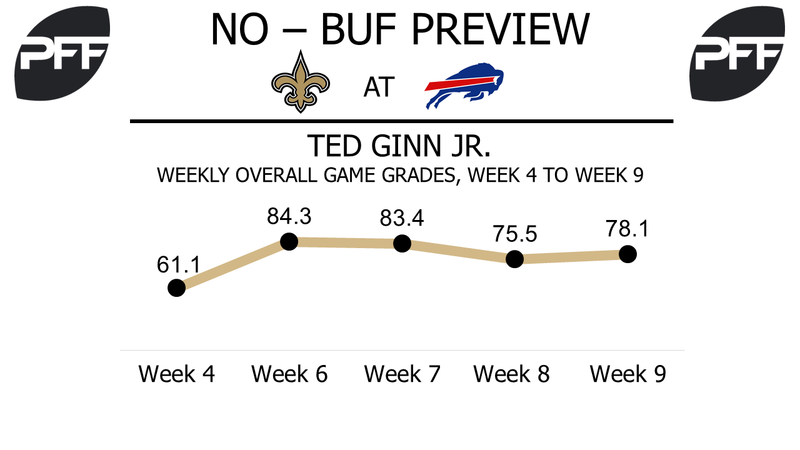 WR Ted Ginn Jr. vs. CB Tre’davious White – Ted Ginn Jr. has made significant strides in the Saints offense this season, and his performance has raised his overall grade from a 52.7 in Week 4 to a 79.8 through Week 9. That’s the fourth largest positive grade differential among all wide receivers in that time span. His 147.3 wide receiver rating is now the second highest of wide receivers with at least 25 targets, and his catch rate on deep passes of 60.0 percent is the third best among eligible wide receivers. Buffalo will send out Tre’davious White to cover Ginn Jr., and must feel confident in doing so. White’s 87.1 overall grade is tenth best out of 115 eligible cornerbacks, and he’s allowing a reception for every 13.5 snaps in coverage, 24th out of 73 cornerbacks with at least 198 coverage snaps. RB Alvin Kamara vs. LB Preston Brown – Alvin Kamara is coming off his highest graded receiving game of the season with a 94.6. However, it would be mistake to pigeon-hole him as a receiving back, because he’s greatly improved running the ball as well. Kamara’s raised his overall grade from a 61.2 after Week 4 to an 80.2 after Week 9, a 19-point jump that’s ninth most among running backs over the last five weeks. His 67.2 elusive rating is the fifth best mark among 50 running backs with at least 49 attempts. He’ll often be the responsibility of linebacker Preston Brown, whose 7.8 run-stop percentage is tied for 24th out of 55 linebackers with at least 127 run snaps. Brown’s combined tackle efficiency versus the run and pass of 16.3 is tied for 13th best among 58 eligible linebackers. WR Michael Thomas vs. CB E.J. Gaines – Michael Thomas and his ninth-best 83.4 overall grade has maintained his excellent play all season. His 2.04 yards per route run is also tied for ninth among all wide receivers with at least 196 snaps in route. The return of cornerback E.J. Gaines should bring with it a difficult challenge for Thomas. Gaines’ 80.7 overall grade is tied for 36th among 115 cornerbacks with 140-plus snaps, while his 0.83 yards allowed per snap in coverage is 22nd out of 114 qualified cornerbacks. T Jordan Mills vs. 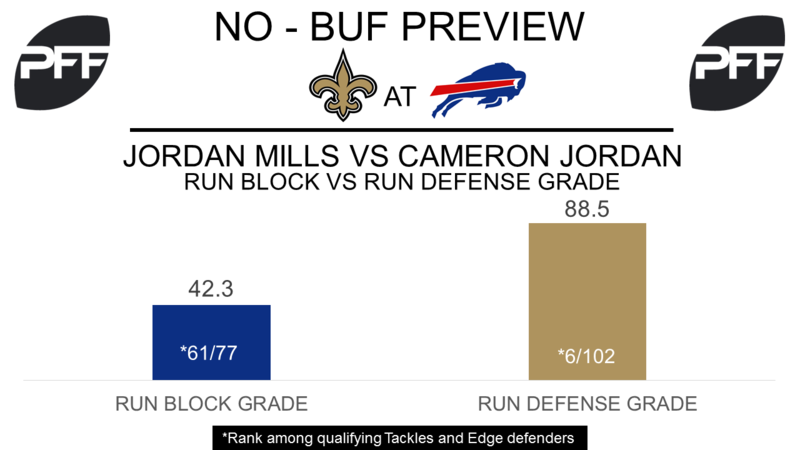 Edge Cameron Jordan – While Mills has been solid this year, with an overall PFF grade of 72.5 which ranks 33rd among offensive tackles this season, he has been a disaster in run blocking. His run-blocking grade of 42.3 is one of the worst this season, 16.3 percent of his run block this season have earned a negative grade, a mark that is well above the average of 13.6 percent. Mills will have a difficult challenge ahead of him when he faces Jordan, a defender whose run-defense grade of 88.5 ranks sixth among edge defenders this season. Jordan has 12 stops in run defense so far this season, the 13th most by an edge defender and has recorded a positive grade in run defense on 17.8 percent of his run snaps, well above the average of 13 percent. WR Kelvin Benjamin vs. CB Marshon Lattimore – Benjamin is expected to make his debut for the Bills on Sunday and he should upgrade the Bills receiving corps immediately. Benjamin is now the Bills highest graded receiver with an overall PFF grade 79.1. Benjamin has been one of the better deep threats at receiver this season, catching all five of his catchable deep targets for 157 yards and two touchdowns (a deep pass is anything targeted 20 or more yards downfield). Lattimore has so far had the best season PFF has ever seen from a rookie, his overall PFF grade of 94.1 is the best by a cornerback in 2017. Of cornerbacks with at least 250 coverage snaps, he has allowed the second-fewest yards at 160. He has yet to allow more than 38 receiving yards in a game, and hasn’t allowed a touchdown.